I just came home from my friend’s house. We have dinner together every week. I’m helping her re-decorate some rooms in her house which is what prompted this post.We’re on room three now. It’s a lot of fun. I love helping other people with their homes. She gave me the highest compliment, “Rebecca, you should really go into the interior design business”. Aw…….. Her remarks prompted me to think about ambitions, money, and success. There are lots of things I love to do and interior design is one of them. But the reason I like it is precisely because I don’t get paid for it. Money would definitely spoil it for me. My friend wants to keep the cost of these projects down to a minimum. So far we’ve mostly just purchased paint. Tonight, for example, we “shopped” in her basement and found the perfect piece for her bedroom dresser. The color scheme is sea-foam blue, jade, and then a yellow- tinged green. The walls are the sea-foam color, soft and pretty. 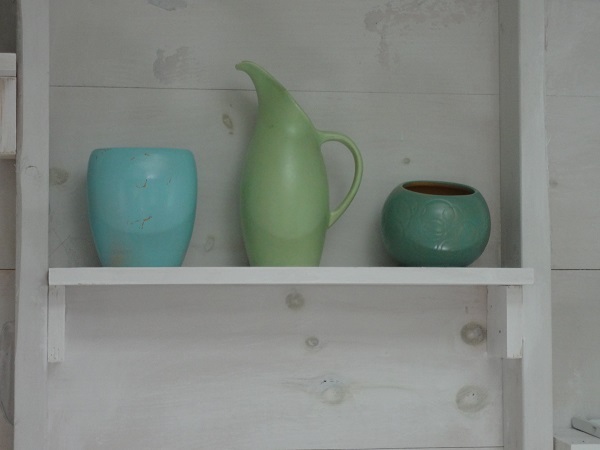 Colors are very similar to vases in this picture which sit on the wall in our La Cabinette. One bedside table is painted jade. I mixed up a chalk paint for her to use. It was what I used in a room in my home. It is a wonderful color.The ” paint guy” at Home Depot and I worked hard to get that color. I love that no one else has it. Two chairs in the room, formerly a dull, ugly grey with a gray seat, have been sprayed Eden Green by Krylon. She recovered the seats in a soft cream to match her drapes. A small table that her computer sits on will be painted the “one of a kind blue”. On the table is a smallish rectangular basket that will be painted in the Lemon grass yellow.I We are choosing lighter colors is because her bedroom furniture is dark wood and this will soften these pieces considerably. Now we’re working on her den. She needs two larger end tables. Again, we shopped in her basement. (She has a lot in her basement.) We found two end tables we can paint. We’re going to be on the look-out for two “new” lamps at garage sales .We are also looking for a very large picture frame. She has three small pictures on three different walls. We will group them together inside the frame so they present a more cohesive look. In the blank spot that is left, she will buy one of those wonderful stick-on sayings that are so popular now. I think it will look great. We’re making very small changes in that room but the changes we are making will make a big difference. No one has to spend a lot of money re-decorating. Except for my upholstered pieces, there is very little in my house that wasn’t purchased in a thrift shop or a garage sale. When I do buy new, I always look for “damaged” pieces. Who can’t fix a scratch? And who really cares, if it won’t be seen anyway? Why would I ever want to work with someone who can afford to go out and buy everything they want? Where’s the fun in that? It’s so much more fun trying to decorate on a really limited budget. Plus, it sparks my creative juices for my personal decorating projects. Anyway, if you’re thinking of re-doing some rooms, take it from me-you don’t have to spend big bucks. Paint some things, change some things. Take all accessories out of the room and start all over putting everything in a different place. Prop up some pictures, rather than putting them on the wall. If an object is sitting on a surface, can it go on the floor? If it’s sitting on the floor, can it go on a table? If the color is wrong, paint it. Anything can be painted. Trust me on that one. And finally make sure there is some contrast. See some related articles here, here and here. I’m a painter and I know the importance of contrast. However, if it’s a piece you don’t like and don’t want to paint or discard, then you don’t want so much of a contrast. Keep this contrast suggestion in mind when you’re re-arranging pieces. Play. Have fun. Let your imagination take over. Remember, you can always put everything back the way it was, unless you painted it, of course. 🙂 But I’ll bet you don’t. Have fun and God bless. 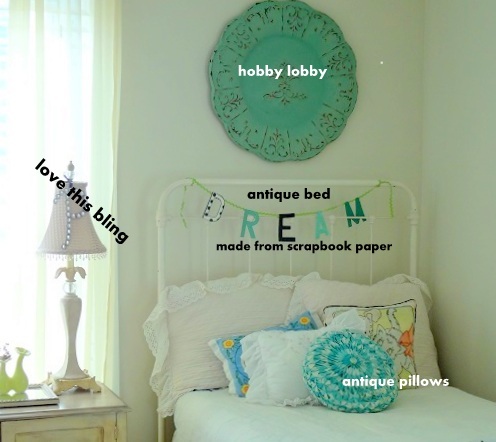 This entry was posted in DIY, LIFE 101 and tagged color selections, DIY, friends, fun, helping a friend, inexpensive, inspirational, interior design, money, painting furniture, redecorating, thrift shopping by Rebecca. Bookmark the permalink. FYI Dibs on Resale have all art work and frames 1/2 off the week only.